Seeing the photo of beautiful picture of a giant Lily, strewn with flowers, it's hard to resist buying a "tree-like" beauty. But to avoid becoming a victim of fraud, it is better first to ask the information about lilies in General. In the spring the market can meet the sellers of the bulbs of lilies, around which is always a crowd not only of onlookers and buyers. And those and others, as a rule, cannot take their eyes off of the photos that accompany planting material. This pyramid-shaped large Bush with flowers of white, pink, purple, orange. The price is "exorbitant", but if you take two, then the third bulb have to offer as a gift. Well, how to resist such a tempting offer? However, when purchased lilies bloom, the hostess discovers that they are the most common, only a little bigger. Well, if the color is different, and that is that he is no different variety. The concept of "tree" is well known to gardeners in Association with the pion, so the "tree Lily" does not bother anyone. But the peony got its name thanks to its powerful rhizome woody, not giant size. Lily, even if very large (like a tree) is still bulbous plant. Breeders who have knowledge about all existing in the world 6 thousands of varieties of lilies, saying that the tree the Lily is nothing but a myth invented by the scammers. And skills photoshop allow you to work wonders. Experts explain the emergence of "new" varieties of lilies that many hybrids are "capricious" and can even get sick from too much nutrients. The disease is called fasciate – splicing of several stems in one. In this case the plant looks like a single trunk with a "cap" inflorescences on the top. This phenomenon is not the norm, but the exception to the rule, when once in a few years ' growth in one place Lily suddenly coalesced. Most likely, remembering the sight, scammers represent it in different colors under the guise of "tree" Lily. There are a variety of giant lilies, which can be represented as a tree – kardiokrinum. Sight during flowering is really amazing, but blooms a sort of 1 time after 7 years, then dies. Therefore, information about caring for large hybrid lilies, if they are attributed to the lilies, the trees must draw from the usual sources about all kinds of Lily and lilies in particular. All lilies tolerate partial shade, because the hot sun dries the soil quickly. However, the Asian varieties of lilies and this condition is transferred satisfactorily. Cultivation of lilies and fertile soil is much more important than frequent watering. If the region has the danger of spring frost, plant the bulbs better to a depth of 20 cm. Then they come in later and bypassed the threat of freezing. When landing it would be good to add pine sawdust, it will affect their full development and bloom. Layered in the winter shelter is not required, except that the Eastern representatives of the hybrids do not like excessive moisture. In the fall cover them with fallen leaves, and on top of polyethylene. In the spring, before germination, it is advisable to fertilize with nitrogen and mineral supplements. Organic Lily is also responsive. Efficient wood ash as a fertilizer and protection from pests. When the first sprouts, they are watered with a solution of Bordeaux fluid. When the buds it is recommended to make fertilizer, and the above-ground part of the processing against diseases and pests. Many varieties require no special care and is highly resistant to disease, but the hybrids require more careful attention, especially tall. 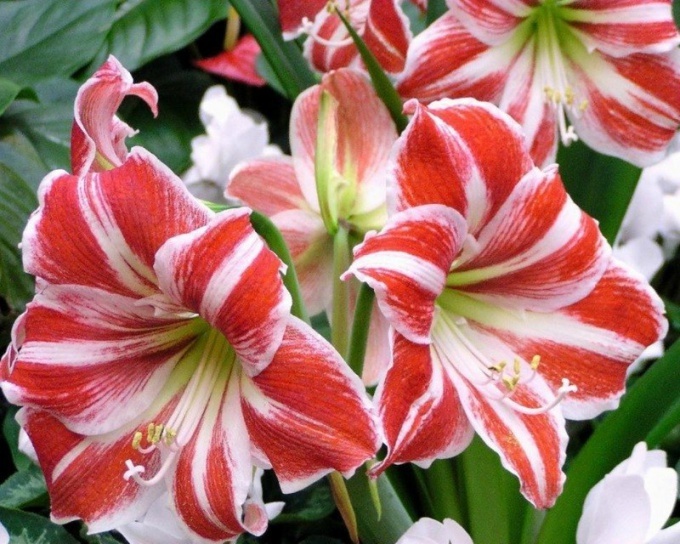 If this Lily is not transplanted 3-4 years and thoroughly take care of it, the plant will please abundant flowering, and some varieties growing up to 1.5 meters. Why not "tree" Lily! If you want to put lilies on your site, then your introduction will start on the shop counter. The best solution is to buy bulbs lilies in a specialty store or at exhibitions of flowers from fans-collectors who often are true professionals in growing healthy plants. In any case, no matter where you tried to buy a Lily, it is worth to pay special attention to the choice between full bulbs of plants. Lily bulbs need to select large, dry, with fleshy scales. Unacceptable signs of disease and mechanical damage on any parts of the bulb, so very carefully examine its scales, roots and the bottom. Buying bulbs lilies it is better to attend an early spring or fall, before planting in the ground. Deadlines for planting bulbs in the ground in autumn – end of October spring – early may. If Lily purchased in advance, then store the bulbs in packaging with perforation, in a cool dark place, at temperatures not below 4 °C, for example, in the lower part of the refrigerator. Storage space should be dry with sufficient quantity of air. In such circumstances, Lily bulbs may start to rise. In this case, you need to open the package and see that the young stem is not subjected to deformation. A nice feature of the cultivation of lilies is their ability to grow and fully develop in one place for up to five years. The main thing - to choose a suitable place for a flower garden. 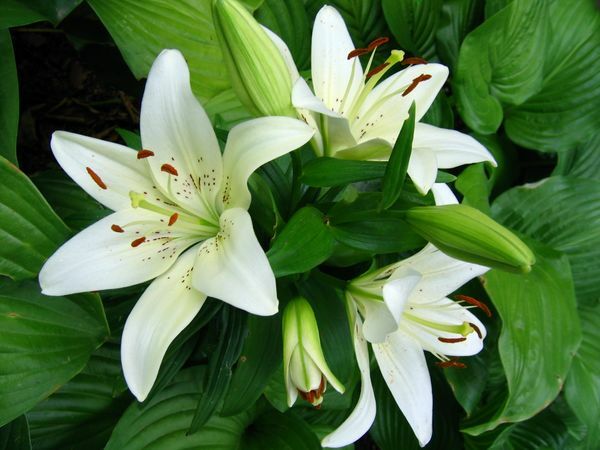 The Lily – lovers moderately moist places in partial shade with well-drained soil. 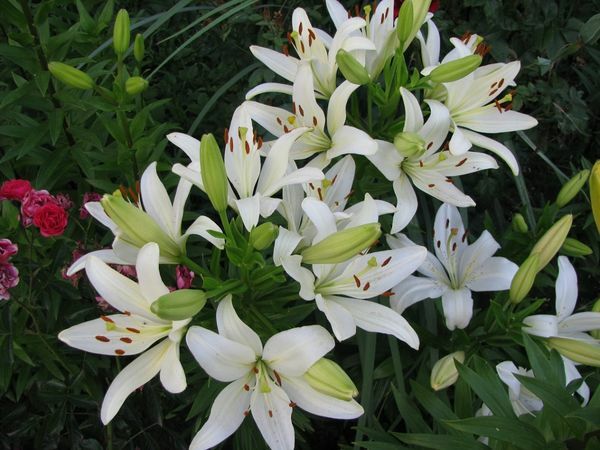 The most favorable period for planting Lily is at the end of September, when the plant is at rest. In prednisalone activities include the removal of damaged scales, shortening the long roots and treatment of bulbs systemic fungicide. Lily is very responsive to the use of growth promoters, so that they can safely use. For example, first the bulbs treated with 0.2% solution of fundazol for 20 minutes, dried and withstanding their time in Epinay. Lily bulbs be planted one in each planting hole and compacting the ground around the plant, fill them so that the soil completely covers the top of the bulb. Don't forget about the fact that the optimum depth of planting bulbs 15 cm and Then to mark the place of landing lilies, forming the surface of the earth circumference around the landing pit, and sprinkle a handful of granular fertilizer. On the growth of bulbous species of flowering plants, including lilies, has a beneficial effect fertilization. 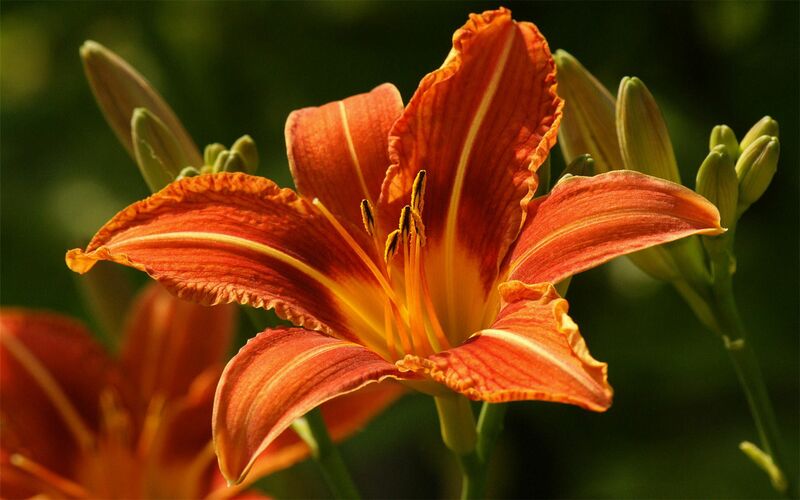 Many gardeners are interested in breeding lilies, it is recommended to use granular fertilizer for bulbous flowers, which is specifically designed for this group of plants. Fertilize lilies twice per year. Autumn in October, the nutrition is carried out fertilizer, not containing nitrogen, and in the spring, once the soil surface will seem young leaves – fertilizers with nitrogen. It is not necessary to use organic fertilizer, the excess of organic matter in the soil contributes to infection of fungal diseases of lilies, but introduction to soil wood ash will have the opposite effect. For the prevention of diseases and spread of pests recommended up to three times a year spraying of lilies 1% solution of Bordeaux mixture. Care lilies mostly undemanding, but there are still a few secrets that you need to know to begin the cultivation of this beautiful plant. The landing of the lilies is better to choose on the site such that the lower part of the stem of the plant was in the shade. This will avoid overheating and drying out the ground around the bulbs. With this, you can plant lilies in the compositions of the low or medium floral crops. Lily especially well in such plantings with daylilies, hosts, nwankama and bells. Care of lilies during flowering is providing small irrigation. If the flowering period coincided with the drought, it is necessary to profusely pour water on the plot with colors a few times to avoid water depletion of follicles. After Lily Bud, watering can be quite to stop. When you cut lilies in a bouquet be sure to leave part of the stem with leaves above the ground. This will allow the bulb to continue full development. The slice needs to do a braid, so that rain water does not enter the stem and cause it to rot. In autumn, cut all the shoots of the lilies, leaving the stems up to 20 cm. To Lily suffered during the winter from frost, they need to cover. To use for shelter can be sawdust, the foil, agrotextile, twigs and other materials. The main thing is to check that the soil and the material was completely dry. In the spring after the danger of frost cover need be removed in order to ensure the normal development undeformed shoots of lilies.